KABUL, Afghanistan (CNN) -- Two separate militant assaults Saturday in the southeastern Afghan province of Paktika led to the deaths of two U.S. soldiers and at least 42 insurgents, military officials said. 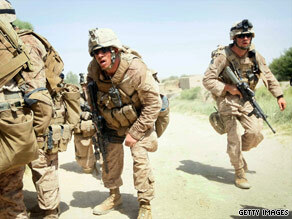 U.S. Marines, under fire from a building, move to take it Saturday in Helmand province, Afghanistan. The soldiers died when Taliban fighters attacked a base in Zerok that houses members of the U.S. military, Afghan national police and Afghan National Army, said the provincial governor's spokesman, Hamidullah Zawak. He said the Taliban first detonated a truck full of explosives, then attacked the base with missiles and rockets. The military responded by sending in aircraft and dropping bombs, killing 32 Taliban fighters and wounding many, Zawak said, without giving a number. Seven of the wounded Taliban fighters were arrested. Zawak said one U.S. soldier was killed and another wounded. Sgt. Chuck Marsh, however, a U.S. military spokesman, said two U.S. service members were killed and four wounded. Two soldiers from the Afghan National Army were also hurt, Zawak said. A Taliban spokesman claimed responsibility for the attack in a phone call to a CNN stringer in Kabul. Several hours later, at least 10 militants were killed and one detained in an assault on a combat outpost in the province. Insurgents attacked with indirect fire, including multiple rockets and mortars -- at least one of which contained white phosphorous -- small-arms fire and a car bomb, according to a statement from NATO's International Security Assistance Force (ISAF). Soldiers from ISAF and the Afghan National Army fired back, aided by planes and attack helicopters. No civilian casualties were reported. • On Saturday, a suicide car bomb detonated near a private security company in Lashkar Gah city in Helmand province. One person was killed and five were wounded, said Assadullah Sherzad, Helmand provincial police chief. • The U.S.-led Operation Khanjar, or Strike of the Sword, is targeting Taliban militants in Helmand province, near Paktika in southern Afghanistan. Thousands of U.S. Marines and Afghan soldiers are trying to rout the Taliban from strongholds in the Helmand River Valley. The operation began early Thursday. Helmand's poppy crop produces more than half of the opium cultivated in Afghanistan, the source of 90 percent of the global supply, according to the U.N. Office on Drugs and Crime. The revenues help support the Taliban. • On Tuesday, a U.S. soldier was abducted in Paktika province. The Taliban claimed responsibility. A senior U.S. military official later said the soldier was being held by the militant Haqqani clan, a Taliban-affiliated network led by warlord Siraj Haqqani. The Haqqanis -- who operate on both sides of the Afghan and Pakistani borders -- are well-known to the U.S. military, which said it was using all means to locate the soldier, whose name has not been released. CNN's Atia Abawi and reporter Wahidullah Mayar contributed to this report.